This page displays the empirically modeled Earth's dynamic magnetopause (Lin et al. ) and bow shock (Chao et al. ) shapes driven by real-time solar wind parameters (up figure). Modeled magnetopause sub-solar distances (bottom figure) as well as geosynchronous magnetopause crossings (GMC, see the table) are also shown. 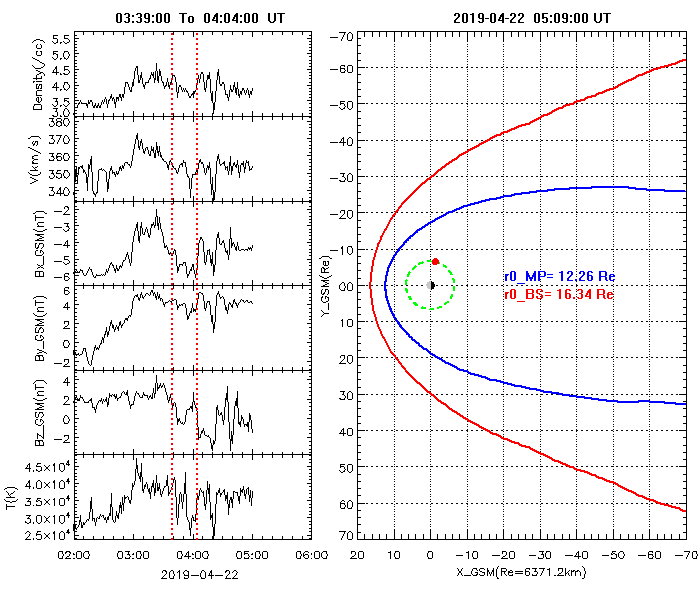 The left panel of the up figure shows the ACE real-time solar wind parameters, while the right panel shows the nowcast of the magnetopause (blue) and bow shock (red) in the GSM X-Y coordinates driven by the solar wind parameters between the two red vertical dotted lines in the left panel. In the right panel, the green circle and the red dot indicate the geosynchronous orbit and the geosynchronous satellite at 0 degree longitude, respectively. The sub-solar distances of the magnetopause and the bow shock are listed in the center. When GMC occurs, dawn-side and dusk-side longitudes of the crossing points will be listed at the bottom of the right panel. Bottom figure shows the modeled magnetopause sub-solar distance (r0) at one-minute resolution. The red dotted line indicates the sub-solar position of geosynchronous orbit. GMC happens when r0 reaches down the red dotted line. The Table lists the alerts and the summaries of the GMC events. An alert (row of dark gray) will be issued immediately when a GMC happens and a summary (row of light gray) will be issued when the GMC ends. Note that the solar wind parameters from ACE real-time data are different with those either from NON real-time ACE data or from OMNI data, especially the solar wind density parameter under the weak solar wind conditions.